The day the Go Wild tickets were released I was hitting refresh every few seconds and ultimately entered my card and scored a $500 ticket to the event. “Oh cool, that’s my Prom day” she said. Que record scratching noise. My bubble was busted. I screwed up and had the dates wrong and because Go Wild Tickets are non transferable, non refundable, I ultimately threw $500 out the window (yes I emailed, no refunds, which they were very clear about before I bought my ticket so I totally understand). No, Brooke doesn’t need me for her to go to prom, but she’s my last baby, and missing out on this isn’t an option. When I think of it, missing Go Wild hurts far less than missing my sweet tiny baby go off on one of her last high school milestones. I’ve hidden most of the posts I see about Go Wild. I’m not bitter about not going, but I don’t want to get to that point. So here we sit. 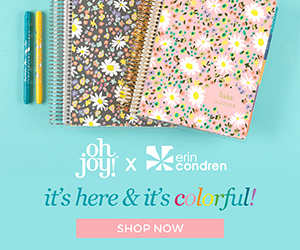 Finally, forcing myself to enjoy at least a little of the hoopla going on, I dove in to Etsy to find Go Wild Planner Items so I can decorate my planner anyway and ran across some of the very cutest stuff. So I’ve listed the stuff I’m adding to my cart here – go support these small businesses and grab yours too! Go Wild Official Merchandise Mini Kit by YDavis (Use code BRANDY to save 10% and mention me in the notes to receive my sampler. If you have your own favorites drop them to me in the comments below and be sure to tell us where to get them so we can support the shops!